Etihad Airways has launched an exciting new program to improve sleep quality on its long-haul flights. Since July 2012, Etihad Airways has been working closely with a panel of sleep experts from the American Centre for Psychiatry and Neurology (ACPN) in Abu Dhabi to research ways to enhance sleep in-flight. The center is staffed by American Board-certified aviation psychiatrists and neurologists and is renowned for its work in the field of aviation health. Dr Yousef Abou Allaban, managing director of the American Centre for Psychiatry and Neurology, said: “What is encouraging is that there is an airline placing tremendous importance and resources into the study of sleep on long distance flights. The unique mattress is made from extracts of the Hevea tree, a healthier alternative to standard petroleum-based foams. This natural rubber is known for its elasticity and is perforated with tiny holes to create a perfect ventilation system, enabling the material to breathe and regulate body temperature. The new bedding set features a 100% cotton fitted sheet and a large down feather duvet and pillow. 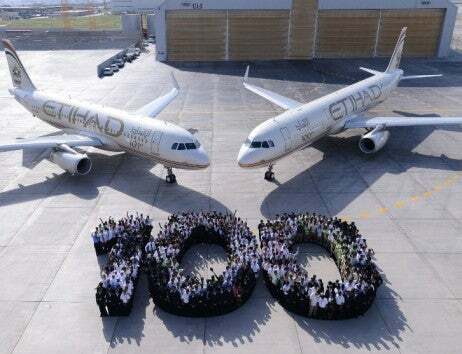 Etihad Airways is the only airline in the world to provide this bespoke product.